I went to pick up Zoe. I put Django’s boots on first, because of the salt. We walked over there. It was cold. We went up and Marianne was just coming in from shoveling. Her face was rosy, like a storybook child’s. Katharine Hepburn and her sister were at the kitchen table. I said hi and Marianne leashed up Zoe. Elaine said, “Look at Django’s boots. They’re so cute!” “You should see her with her coat on,” I boasted extra loudly, like an intrusive home help lady from a British mystery novel. Back outside, I felt bullied by the cold. I walked the dogs up north, aiming for a mailbox so I could mail my letter. But my hands were starting to ache, like the last gasp of water in the tray before it freezes into ice. I was so cold I started to whimper, so quietly that passersby didn’t notice, so quietly that even the dogs didn’t turn around. I decided to stop home and warm up. My hands were so numb I could barely unlock the back door. The dogs bounded in. Django stopped on the rug and waited for me to take her boots off. Zoe jumped up on a counter, looking for snacks. I whimpered more loudly now, “Ow. Ow. 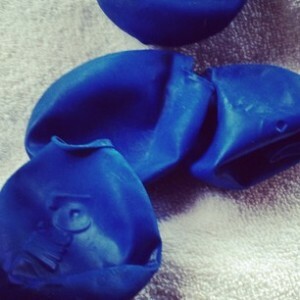 Ow,” as I pulled off Django’s disposable balloon boots. I rubbed my hands together briskly, like a Buddhism teacher on Lawrence Avenue once taught, reminding them what circulation feels like. As they thawed, Dave came in the back door from rehearsal. He offered to walk Zoe back with me, noting that Django didn’t need to go out again. “She’ll get cold,” said Dave. “It’s only three blocks,” I said. I figured we wouldn’t have to carry her until we were on the way back. Dave leashed her up and we started walking. When we got to the first salty stretch of sidewalk, I tried to walk fast, like that kid from the Bazooka cartoon who paints the fence quickly because he’s running out of paint. Django stopped and held up a paw. “Come on, Django,” I said annoyed, “There’s hardly any salt.” Zoe and I were already at the end of it. But Django held up two paws, switching among them to keep herself upright. “Django, come on!” She started shivering, like an old lady. Dave picked her up and shook his head without shaking his head, like a statue of a person who is about to shake his head. “I’m sorry,” I said. “Go on back. I’ll be home in a minute.” I continued on with Zoe, who plowed happily through snow, salt and ice like a draught horse. When I got to Katharine Hepburn’s, the kitchen was as dark as night. I let Zoe in and wondered if it would be rude to just leave. Then Miss Hepburn’s sister came in from the hall. “My boots are snowy so I won’t come in,” I explained from the back door. Miss Hepburn’s sister told me briefly about Miss Hepburn’s upcoming surgery and effusively complimented Marianne’s shoveling and asked politely about Dave’s playing and my projects. She is the most civilized person I have ever known, like Maggie Smith in Tea with Mussolini. She gives me hope for 92, or 93, or whatever she may be. I walked home without whimpering, just like a person with their hands in their pockets. a www. i like that django has her priorities straight. warmth, good treats, a soft perch from which to look out the window, good humans to manipulate. walks are nice, but not when the salt hurts and the cold makes your companion whimper. and I like that Dave can shake his head without shaking his head. and that soon it might be spring. What I really don’t like is the change from balmy to frigid overnight, the kind of change we’ve had several times this winter already. I don’t mind cold once I’m acclimated, but it’s tough to take a day in the teens after it’s been in the forties for several days. Well, of COURSE you’re taking her side. I hope Sulley is liking his new winter gear. I’m going to teach him how to whimper next time he’s here. Aw. Somehow that’s so much cuter when it’s a smaller dog who is easier to carry home. Really? I give you excellent mitten information and you mock my egg cooking abilities? Heavy sigh.